Correction, there are 145 stations. There is one missing from the image below but the spreadsheet is correct. This Saturday, June 30th, I’m going to do a NiceRide 144 challenge. As in, try to visit all 144 NiceRide stations in on day. The map above is the approximate course. You’re welcome to join me for all or part of the route. 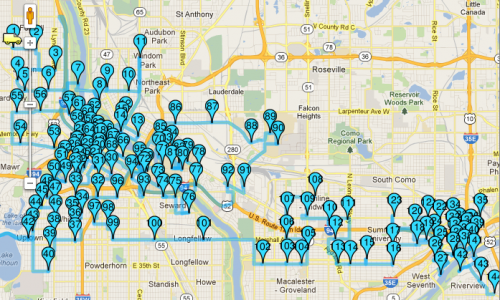 Where: Start: Penn & Lowry NiceRide station in North Minneapolis. Finish: Near Boca Chica in St. Paul. They have a nice patio for a post-ride beer. How: One NiceRide bikes, of course. If you plan to join for this, be sure to have a NiceRide key. The transitions are painful with a credit card compared to the NiceRide key. Safety: wear a helmet. Don’t do anything stupid. Be sure to bring a copy of the Station Guide with you. Note: I’ll park a car or van (depending on how many people plan to show up) at the end, so can shuttle people back to the start. If you’d like to throw a change of clothes or anything else in that, drop it off at my house by Friday at 9pm. RSVP and find more Deets on Facebook. The Station Guide spreadsheet below has a list of the stations in the order I plan to visit them. It’s slightly different than the map above because the above map was built using driving directions. I’ve been making a few tweaks to that, such as using the Stone Arch Bridge to cross from St. Anthony Main to downtown to increase efficiency. I’ve also been adding additional descriptions to stations to expand upon NiceRide’s descriptions. For example, NiceRide has a station called “St. Thomas” which is a very large area to look for a station that’s actually on Grand Ave west of Cleveland near Davanni’s. I don’t want to make this harder by riding in circles looking for stations. The geocodes for each station are provided in case you want to play around with your own mapping options. * There is nothing official about this. I’m doing it, and you’re welcome to come along. Questions? Post a comment or email me. My cell is 651-592-4063 in case you want to call or text me about this. Awesome! This is a pretty cool event. I bet if you contacted NiceRide, they’d be willing to support the effort – maybe loaner keys for the $5 price just for people to use for one day only, just so they didn’t have to fiddle around with credit cards? They might even throw in some of those Green Helmets they’ve been talking about. Unfortunately, I’ll be at Collins Family Cyclefest this morning, so I won’t be able to attend. Maybe next year! I have been talking about this type of event since last year. i am very interested in going with you. At least through 101 or there about. I live 2 blocks from stop 74 if we will need a toilet break. My number is 612-382-1383. How accurate do you think your time estimates are? I’d love to meet up at 91 or 92 and ride for awhile. @Reuben, this town sure has a lot of Cyclefests. Sorry I’m going to miss that this year. @Tim, nice! Should be fun. @Sarah, those time estimates assume a 1-minute transition, which is very generous. I think we’ll be well ahead of that pace. Maybe even by an hour by 91-92. I hope to join you for a bit at least. I have family coming into town sometime Saturday, or I’d join up for the ride in its entirety. By the way, http://www.cyclopath.org is an excellent mapping site for bike routes. I probably can’t do the whole 145, but will you be checking in somewhere, maybe on twitter with a #miceride145 hashtag or something similar? Previous Previous post: Ad Supported Free Drinking Water?